Featuring an EZ Release drop arm for safe side transfers, the Drop Arm Commode is ideal when assisting bathroom safety. 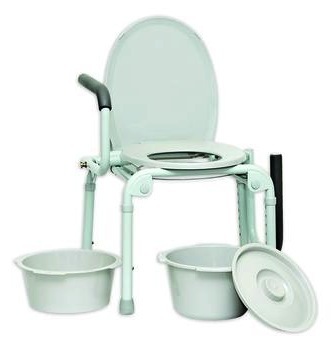 Made from gray, powder-coated 1" steel, the commode is durable and accommodates users up to 300 lbs. A removable backrest and soft hypolon armrests provide comfort. Assembly is easy as tools are not required. Snap-on seat with lid easily removes for cleaning. Complete with a bucket with lid and splash guard; messes are kept to a minimum. Features an EZ Release drop arm for safe side transfer. Adjustable seat-to-floor height: 17" - 22"
Seat Size: 14" x 16"